Click Here For Confessions of a Lazy Internet Marketer! Writing for the Internet market (online marketing) is quite different from writing offline ads, reports, books or articles. The internet is huge, and is quite a busy place. People come searching for information. It is not like an offline shop where passers-by will see your window-dressing and come in. People here are not passing by. They are looking for information. Do terms like web-marketing or website publishing freak you out? Be scared no more; the web is NOT a scary place; it is a place of opportunity - endless opportunities! When an idea was born in my mind to build a web site, I was scared that it might just end up as an idea - a crazy idea. I didn't know a thing about web sites, HTML, e-commerce or anything like that. I remember writing the question down in my diary: "how do people build web sites and how are they funded - how do they generate income?" If I knew of books like "Make Your Words Sell" and "Make Your Site Sell", I would not have had a lot of unanswered questions. These e-books are very good assets if you are writing and marketing on the net. I'll give you a link below to your free copy of one e-book. Check my links below for a free copy of the action guide that I used to build my web site. Now selling! :-) - our long-awaited public speaking ebook - for kids & adults!! 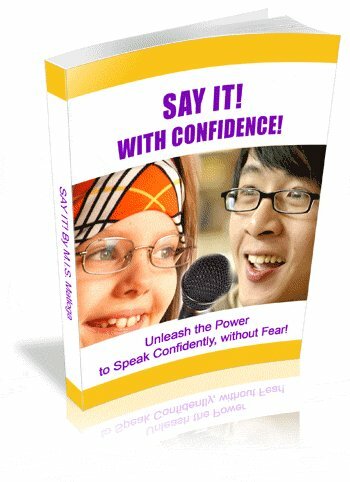 Public-speaking-solutions.com released our brand-new ebook titled: "Say it, with confidence!" The book specifically addresses "fear of public speaking" (including shyness, stage fright & social phobia) and inspires readers, young and old, to become more powerful, eloquent and confident speakers. If you consider yourself or are considered to be shy, you'll relate to to the story of this ebook. The Net is a land of opportunity! Instantly Create Your Own Web Business! Subscribe and receive a free copy of "My web-marketing experience"